The kale is in the ground! Somehow I feel as if transplanting outside should be in national headlines. Newsflash: Food, Now Safe to Grow Outside! Well maybe there are more important things happening in the world, but I just wanted to let you know about a few happening in ours. 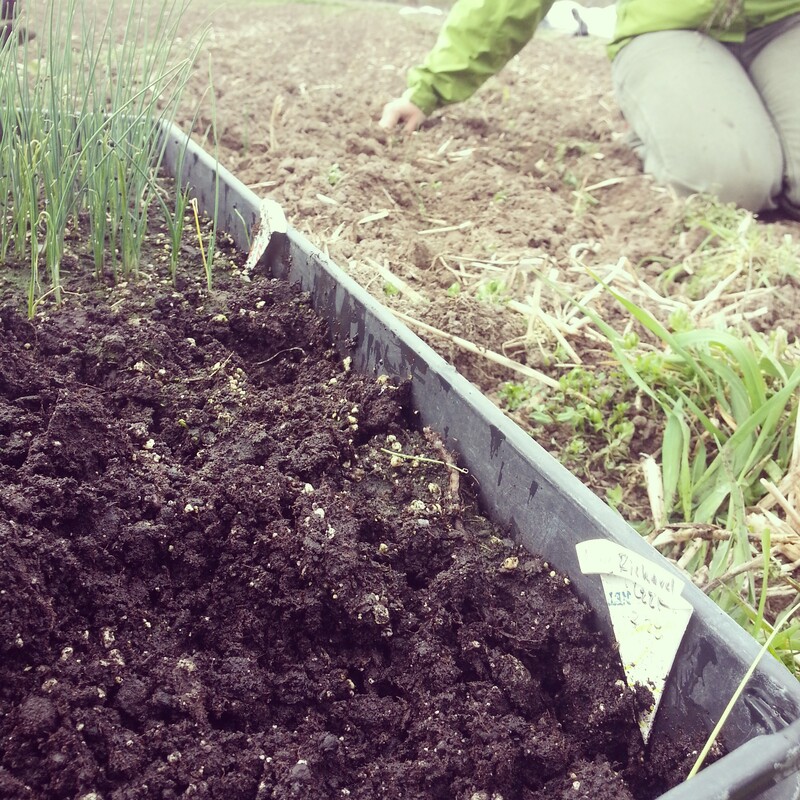 On Sunday, April 27th we’ll have our annual Onion and Potato Planting Party, starting at 3pm, and followed by a potluck and campfire. The following Saturday is kick-off day for the Clark Fork Market! For weeks I’ve been whispering the date May 3rd into the ear of my asparagus patch, and now it’s your turn. Hopefully you’ll both be there. A few things will be changing this year at the Market. For example, in order to increase our spot size we are moving a short way down from our usual space. We will be three tents to the east this year. Tracy also built some amazing market shelves, which we’ll be debuting. Finally, in October the Market will open at 9am instead of 8am, so that we can all get a little more sleep! 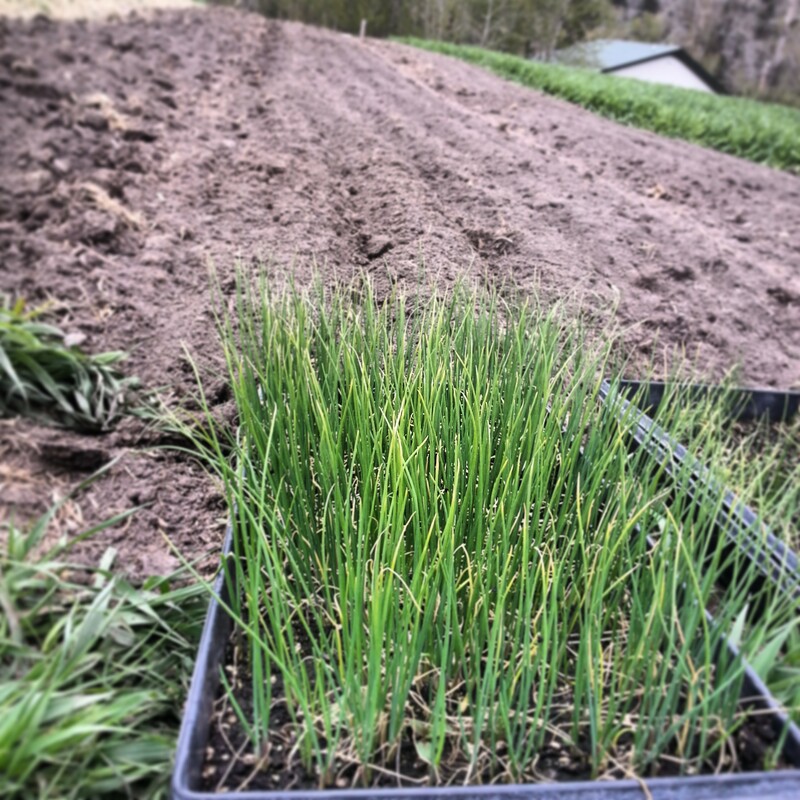 We hope you’ll join us in a few weeks to plant some leeks! Two weeks ago, after months of snow on the ground, it seemed completely absurd to start seeds. Now that the ground is bare and the days are filled with sunshine, however, I feel like everything is happening at once. The spinach is popping, garlic is coming up, weeds are already taking over parts of the barn garden, and the goats are anxious to graze on the barely green pasture. GREEN PASTURE… ok almost green. We are very excited to start the season – it’s been a long winter and we’re absolutely psyched that March is here in force. We have a few new projects for the year. In particular our new Farm Share. It veers away from the traditional CSA box-system and caters to the farmers market. This change means we that instead of planting for specific harvest weeks and amounts, we have a little more flexibility, and so do our members. We are full for the season (woo hoo! ), and we both look forward to seeing you all at market. This year also marks the beginning of my master plan to standardize our fields and make our lives that much easier. By 2016 we’ll have six fields that are all 120′ by 60′ making our crop rotations super easy: two beds planted last year = two beds this year. It also allows us to cut all the drip tape, weed mat, and row cover to the same length every year. This may sound lame. Trust me, it’s VERY exciting. Micah and Katie of Ginger Roots Farm in St Ignatius are letting us borrow a few hogs to tear up a new area of the pasture in a month or two. The hogs, doing what they do best, will clear the grass and open up the soil for cover crop seeding. That saves me from using the disc and tiller on a large section of sod, which is not fun for anyone (especially for Margaret who almost had a heart attack watching the tractor bump around on uneven ground last time I tried this method). Oh, and SAVE THIS DATE! This summer on August 30th we’re teaming up with the fellas at the Burns St. Bistro for an official farm dinner. They’ll prepare courses with our veggies (and other local fare), we’ll give a tour, and then summer’s bounty will be served in the orchard. Set price per head. Keep an eye out for more information! 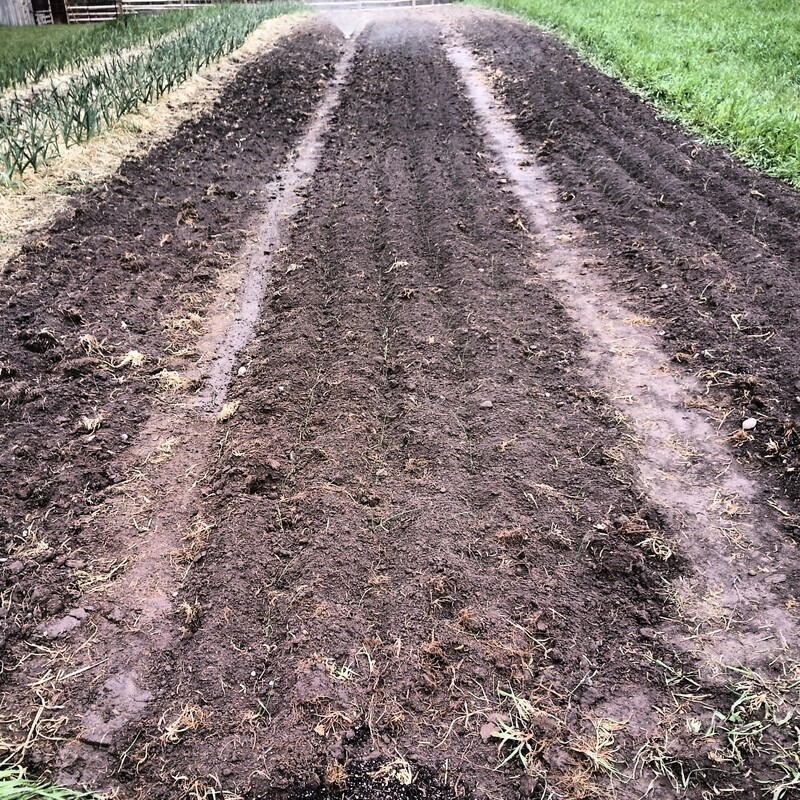 This week there’s spinach a week or two from harvest in the field, seeds in the soil, and seedlings in the greenhouse that are itching to get into the ground. We have a batch of broiler hens in the warm room, a couple mama goats gestating their kiddos, and layer hens out in the orchard. One of our three hives survived the winter, and I’ve harvested honey from the other two. Margaret and I renewed our lease with Steve recently, and knowing that we’ll be here for at least another 5 years feels wonderful. It’s a kind of security and stability that I’m welcoming; it doesn’t have to be forever, but it’s long term enough that we can plan for the future and settle in with the plants and animals that we love. Happy Spring and Merry Planting to all ye farmers. FINALLY some pictures for y’all. I was having too much fun chatting and throwing tomatoes that I didn’t take as many as I’d have liked to. But this is better than nothing, right? Coda got us in the mood for a grand party. He’s ready. All of the ladies at this table came early to help us harvest potatoes. What rock stars, right? Dylan shows his approval of the potluck selection. With a great turn out comes an awesome dinner. Heidi, Emily, Dan, and Noah fill up. 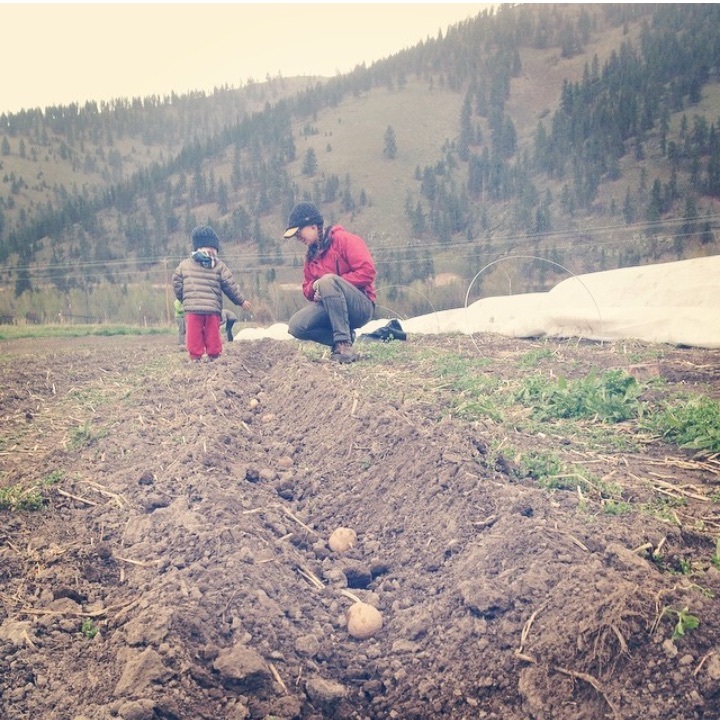 Steffan (Western MT Growers Co-op) and Molly (Clark Fork Organics) hanging out by the remains of cider-pressed apples. Rebecca and Bryce (Native Ideals Seed Company) came with home-made ice cream that killed. The pies never tasted better. Our first ever Harvest Party! Sunday, September 25th we’ll be harvesting potatoes starting at 1pm and once we’ve dug in and gotten dirty, the real fun starts. We really hope you can make all or part of the party, especially if you haven’t made it out to the farm yet. Bring your kids! Bring your friends! Bring your friend’s kids! If you can’t come for the activity portion of the day, we’d love to have you for the potluck. 1-4pm: Potato harvesting. Come help us dig up winter storage starch. The kids will love digging around and finding the biggest and best. 4pm: Potluck begins. Please bring a dish to share (your favorite fall fare!) along with a descriptive sign for our veggie and vegan friends. Signs can be as simple as “Squash Casserole: vegetarian” or as detailed as you wish. Please bring your own plate and silverware. 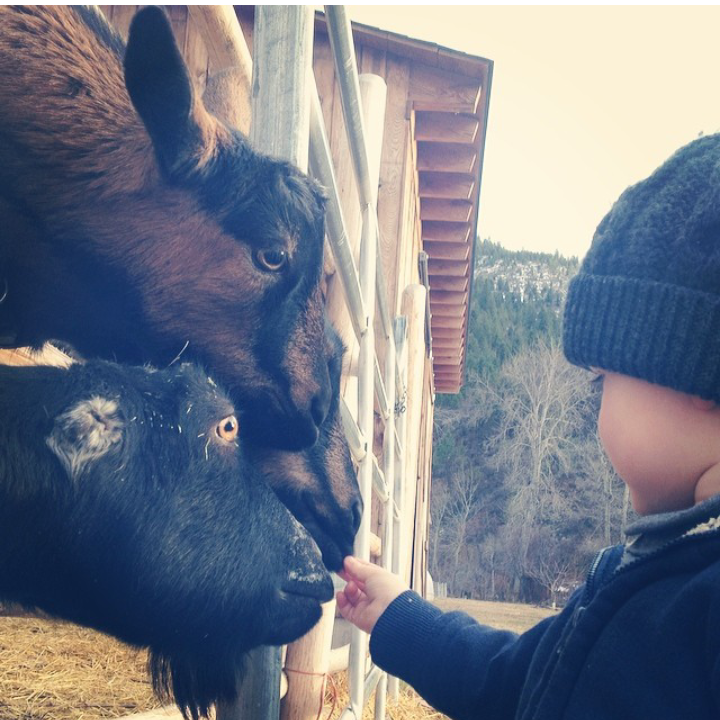 Then comes the good stuff: rotten tomato toss, three leg-ed race, vegetable printmaking, cider pressing (if we have the apples to press), and hay ride. We’ll even have pumpkins to carve or paint to get you in the fall mood. We’ll have some music, but if you play an instrument, bring it! Jam sessions are highly encouraged. If you want to stay the night, please do! There will be a designated camping area for you to set up tents. We’re asking that your dogs stay home for the party. If you need a ride, post on this event or shoot us an email. We want you to get here as much as you want to come! Hope to see you there (directions below). Take Hwy93 north towards Kalispell and Flathead Lake. Go North about 27 miles passing through the towns of Evaro and Arlee. Turn Left in Ravalli at the blinking light onto Hwy200 towards Hotsprings and the National Bison Range. Go a little less than 2 miles and turn left on Pommes de Terre Ln. It’s a small gravel raod which leads to wooden barn and tan house, that’s us. You will be able to see both from the road before you come to the turn-off. Park at the warehouse (the first building you come to) and walk up to the party. Call if you’re lost, our cell phones work just fine up there. County Rail’s first Harvest Party is fast approaching! Sunday, September 25th we’ll be harvesting potatoes starting at 1pm and once we’ve dug in and gotten dirty, the real fun starts. Rotten tomato toss, three leg-ed race, vegetable printmaking, music, and potluck starting at 4pm. We’ll even have a few pumpkins to carve or paint to get you in the fall mood. We really hope you can make all or part of the party, especially if you haven’t made it out to the farm yet. Bring your kids! Bring your friends! Bring your friend’s kids!